Why Ending Malaria May Be More About Backhoes Than Bed Nets : Shots - Health News Malaria remains one of the deadliest diseases worldwide. But the U.S. successfully wiped out the mosquito-borne parasite from the American South in the early part of the 20th century. One researcher thinks this successful campaign offers lessons for how to stop malaria worldwide. 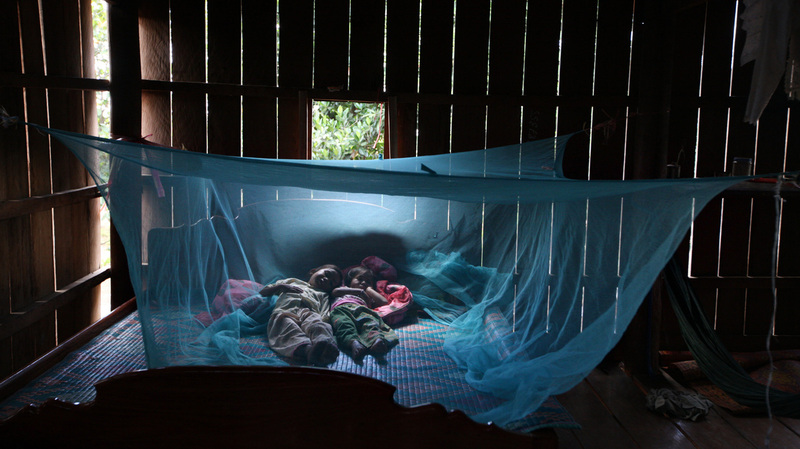 Yonta, 6, rests with her sister Montra, 3, and her brother Leakhena, 4 months, under a mosquito bed net in the Pailin province of Cambodia, where the mortality rate from malaria has dropped sharply in the past two decades. Fewer people are dying now from the mosquito-borne disease than at any other time in history. "And there's a very, very strong belief now that malaria can be eliminated," says Joy Phumaphi, who chairs the African Leaders Malaria Alliance. In 2010, malaria was ranked as the seventh biggest killer in the developing world. More than 200 million people got malaria in 2012, and more than 600,000 of those infected died. By comparison, the world recorded just a few hundred cases of polio last year and less than a hundred cases of guinea worm — two other diseases at the top of the eradication list. So why are global health leaders so optimistic about someday ending malaria? Perhaps because there has been a precedent. And it happened right here in the U.S. The federal government drove out malaria from the American South in the early part of the 20th century. And the lessons learned from that successful campaign could help control the disease in developing countries, says Daniel Sledge, a political scientist at the University of Texas, Arlington. "It's almost impossible for us to imagine," Sledge says. "But in the rural South, as late as the 1930s, the extent of malaria was in many ways comparable to what it is today in sub-Saharan Africa." Sledge and his colleague recently analyzed archived public records to try to determine what factors helped to eliminate malaria in Alabama. The findings were surprising. It wasn't getting people to sleep under insecticide-treated bed nets, or getting better medications to people who do get infected — two major tactics used to control malaria today in sub-Saharan Africa and Southeast Asia. Instead, the parasite left the U.S., in large part, because the government destroyed mosquito breeding grounds. "The primary factor leading to the demise of malaria was large-scale drainage projects, which were backed up by the creation of local public health infrastructure," he says. Sledge and his colleague described their findings this September in the American Journal of Public Health. There had been some speculation that malaria went into decline when tenant farmers started to move out of the hardest hit areas to seek jobs in factories up north, Sledge says. But that wasn't the case. "We found that the population actually increased in highly endemic areas over the course of the 1930s," he says. To wipe out mosquito breeding grounds, the U.S. government had to dig more than 30,000 miles of drainage ditches and canals, the Pan American Health Organization reported in 1963. So this strategy comes with its own set of problems, including damage to the environment. Large-scale drainage projects aren't central to most malaria control programs in Africa and Asia today. But Sledge thinks the American experience with the parasite could be instructive for efforts to wipe out the disease globally.